Today I felt it appropriate to look into my past and share what TV shows have had a major influence on me. While there are many things that push and sway me into making decisions, there are two shows that have great persuasion on who've I become. The first TV show is animated Nickelodeon series As Told By Ginger. The show aired while I was in late elementary (primary) school through middle school. As I'm sure most of you remember, it was an awkward time. Mommy and Daddy don't dress you anymore, you get to join clubs/sports. You're in a new school, friendships either end (on a mutual level) or strengthen, you're adding to your group, new teachers, new beginnings. You can't help but to feel lost sometimes. Even if you are at the top of the food chain, there's always SOMETHING to distract you. Drama, boys, mean teachers. As Told By Ginger set an excellent example of how to gain some independence. ATBG had SUBSTANCE. One of the last cartoon series that I've seen that has a lesson to learn at the end of the episode. ATBG was fascinating because it gave depth to the characters. The three girls that I chose as role models were Ginger (of course), Courtney, and Miranda. What I loved about Ginger is that she is real, down to earth, and relate-able. She values her family, even though they have their disagreements. I love how the show portrayed an excellent mother-daughter relationship. At that age you need someone to turn to for advice - to give you perspective. Lois reminded me so much of my own mom. I could relate to her family situation due to the fact that growing up we had single mothers, who eventually found the man of her dreams. A younger (often annoying) sibling, and a dad with jaded priorities. But no matter what you still love them. She cherishes her friendships, that have the occasional ups and downs. In middle school friendships mean the world to a young girl. The weekend sleepover, late night phone calls, gossiping, sitting together at lunch, picking each other for your dodge-ball team, and passing notes. When Ginger and her best gal pals need a kick in the pants, they do each other the favor of kicking with soft slippers. She is intelligent, always getting academic recognition and awesome opportunities. Another factor that I can relate to. Ginger was in the position many girls in middle school were in: on the outside looking in. And Courtney took an interest in her, giving her a taste of the popular life. But she never lost herself. She stayed grounded. Miranda was a quick favorite to me, not just because Cree Summer played her voice, but because she was a character that you love to hate. During the time that As Told By Ginger aired, pretty much every show similar to it had the main character being harassed and bullied by a nasty Queen B (or King of the Jocks). Miranda was 2nd in command, not the leader in this case. Miranda had Courtney to put her in her place. But as I've said before I love how the show gave depth the characters. She had a police officer father, who would send her to boot camp, and make her play an instrument. This is probably the reason she is so calculating and often cold. But she has a heart as well. She had a brief love interest with Darren and loves Courtney like a sister. She is loyal. Perhaps the loyalty was originally due to the fact that she is a social climber and is trying to maintain her position. But I feel as if she had a genuine bond with Courtney. It's just that when you're friends with Queen B, you follow her rules or you're outcast which happened in an episode. Miranda and myself shared a common extra-curricular of being in band. I played the flute for years, and she played clarinet. Though she wasn't as enthusiastic about playing it as I was. Growing up I loved Miranda's style. Her nails always done, long hair, and her favorite color was purple. She probably had a strong influence on me, because for the longest time, purple and black were the colors I favored. Miranda always had a scheme, which I channeled into "it's always good to have a plan.. and a plan B." Not necessarily meaning having a plan to take someone down, but for example: you audition for a play but don't get the part you wanted. You either take the part they give you, do your very best to shine. Or you do whatever you can to stay involved, if that's what you really want to be a part of. Miranda was deliciously evil. Well, evil is a strong word. But she definitely crossed the line a time or two. I just loved her snarkiness. Her comebacks were hilarious, teaching me how important it is to be able to think on your feet. Being impromptu is a good skill to have. Miranda was a social climber, a good tool to have as long as you don't abuse it. For me, I've always considered myself well-liked and I guess popular. And I feel that having that mindset and confidence in middle and high school is a milestone. And even after highschool is over and you're moving on to college or working full-time, it's good to have people skills. It gets you so much farther. My last go to character is Courtney. What I love about her is she is genuine. Sure she's the leader of the school and the most wealthy, but she is hilariously blonde. Courtney can be materialistic, caring more about her hair and clothes than anything else. But what As Told By Ginger did differently is having the Queen B (normally the arch-nemesis who is threatened by the main character) reach out and take an interest to Miss Foutley. Courtney values her friendships. She is quite similar to Ginger, being an A student, having the annoying younger brother, a father who's rarely around, and having a close circle of friends. The same reasons that I love Ginger are why I love Courtney. But what really drew me to her is that she is confident. I looked up to her because she set the bar. She makes trends, not following them. Just like she makes the rules to follow. She's popular, and honestly who doesn't want to be when you're in middle school? I just love CG, she is so high maintenance and uptight, without being overly snobby. But she's adventurous. She'll step off of her pedestal to befriend Ginger. She'll go to a summer camp because she was dared to. She'll fight for what's hers. My favorite episode with Courtney was "No Hope for Courtney." Because even after Hope took her spotlight, she was able to get it back, and befriend Hope after their war was over. And that's another thing I love about the show is that you get to see the resolution of conflicts and follow because there's more episodes after. I have such an appreciation for ATBG. For me, middle school was pretty similar to the movies that take place in high school, with mean girls and cliques. It mattered who you sat with at lunch, and who you talked to. You were popular if you were in cheerleading or star of the musical. You drooled over the bad boy or the Jocks. The way I remember middle school was almost exactly like the cliche clique movies that never stop being made. High school was different compared to middle school, it was better. Less pressure. But that'll be a story for another time lovlies. Hope you enjoyed! OH! 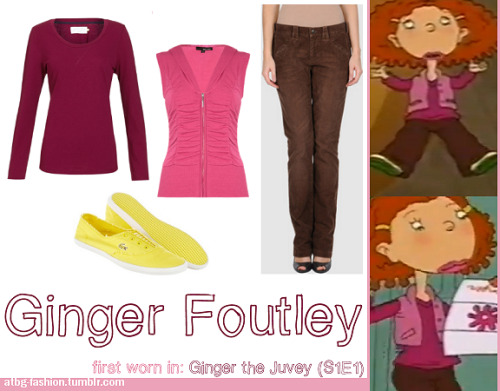 BTW, I found the As Told by Ginger inspired outfits HERE http://atbg-fashion.tumblr.com/archive. This blog is GENIOUS, and I'm sure I'll be putting together some outfits due to the site.